Hello IoTeX Community! 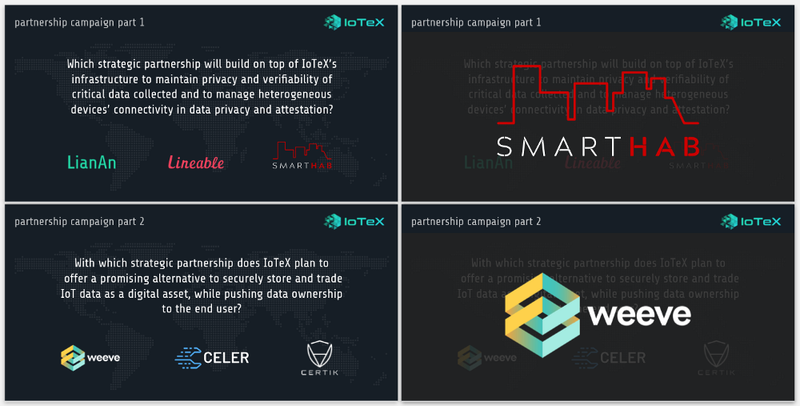 Over the past 2 weeks the IoTeX team has been hard at work in launching our Partnerships Program and website alongside announcing many of our strategic partners including Lineable, Smarthab, Weeve, and more. We are grateful for our community’s continuous support and would like to reward everyone through our Partnerships & Founders Livestream Campaign from 8/24/2018, 2PM PDT — 8/28/2018, 2PM PDT. 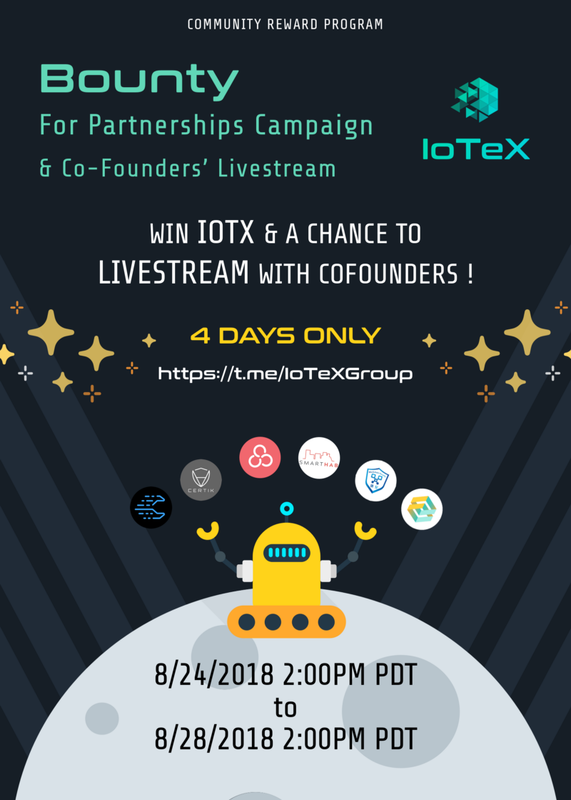 In this campaign, you will have the chance to not only win points but to have a chance to join in on a personable livestream with IoTeX’s very own co-founders to get to know them better and chat with them. Read on to find out how you can participate in our Partnerships campaign and be eligible for our Co-Founders Livestream Session on 8/31/2018, TIME TBD! Follow IoTeX Official Twitter page. Retweet our partnerships campaign part #1 and/or part #2. We will be posting two posters on Twitter (first one on 8/24/2018, and second one on 8/26/2018) each with a mini quiz question related to our partnerships. Include in your retweet’s caption with the respective correct answer and your unique IoTeX HashID. Fill out our Point Redemption Form to redeem your points. You will only be able to fill this form out from 8/24/2018, 2PM PDT to 8/28/2018, 2PM PDT. *Note: You will not be granted points for the campaign if you do not fill out this form. This form is to ensure we don’t miss any participants efforts in this campaign and to guarantee the points will be granted. If you successfully participated in at least one part of the Partnerships Campaign, you are eligible to apply for our Co-Founders Livestream session on 8/31/2018 through the same form. Each successful completion of part 1 or 2 will earn you 50 points. Each participant can earn up to 100 points. Points will be distributed by September 5. For the first time, IoTeX’s very own co-founders: Raullen, Qevan, and Jing will be hosting an intimate and personable livestream to get to know our supporters better and to let you know a bit more about themselves! In this livestream, we will have a mix between discussing pre-selected submitted questions and answering the questions you have for them live. We will be shortening our AMA on 8/31/2018 to 1 hour focused on our Testnet Beta code release. On the other hand, our Co-Founders Livestream session will be open-ended for questions regarding partnerships, team, and even themselves! You can be eligible for this livestream session if you have followed the Partnerships Campaign instructions above and have successfully completed part #1 and/or part #2. Sign up for the Co-Founders Livestream Session through our Point Redemption Form. You are allowed to submit any questions beforehand through this same form — doing so will grant you a chance to be handpicked as a pre-selected question which will be guaranteed an answer during the livestream.